cooking | preciousandmakeup.org || it's just a beauty thing. I’ve been on such a health kick for the past four weeks. I’m always looking up healthy (and quick) recipes to try after a long day of meetings. What I love about this meal is that it’s sure easy (it’s fool proof), quick, healthy, and not to mention it taste great! All you need is a package of mixed veggies (I bought the veggies that were fresh, not the ones that were frozen), chicken sausages (or any kind of sausage you like. I bought the mini cocktail sized sausages that were fully cooked), and brown rice (since brown rice takes longer to cook than white rice, I usually cook up a whole bag the beginning of the week and store it in the fridge. That last me at least a few days.). – Sautee (with olive oil) veggies til tender. I like to add some chopped up ginger & garlic to this as well for added flavor. – Microwave the fully cooked mini sausages (I use 3-6 mini sausages per serving) for 30seconds. Make sure not to microwave the sausages for too long because they might bust. – Cut sausages into smaller pieces. 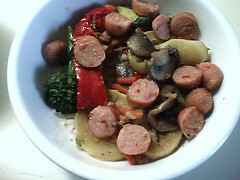 – Serve veggies & sausages over brown rice. – Add a bit of soy sauce for taste. I also like to add a bit of crushed red pepper for some heat.